For a brief moment in time, the Network's Hashing power was getting close to 280 Thps. Bitcoin had its biweekly reset of the difficulty level. From the looks of it, this has eliminated any profitability of smaller scale GPU based mining operations. How does Bitcoin difficulty affect earnings? For those of you who don't understand how the Bitcoin difficulty works. Its a variable that can be adjusted to keep the difficulty of mining for bitcoins high enough that a block is only cracked every 10 minutes. With the recent serge in popularity in bitcoin mining, plus the new ASIC units going online, the hashing rate of hte network has jumped by almost 50% in the past 2 weeks. This means you need more hashing power to make the same amount of bitcoin. what can I expect to make at the 31256961 Difficulty level? According to my BitMinter Client v1.4.0 with my Gigabyte 7950 hashing at about 528 Mhps, I will make .0085 BTC per day running 24/7. With Today's BTC - USD of $92. This puts my daily USD earnings at about 78 cents. or about $23.40 per month. This doesn't include any transaction fees. The profit margin on GPU based mining operations is quickly going away. Older less efficient GPUs could even cost more to run than they make in bitcoin due to electricity and cooling costs. 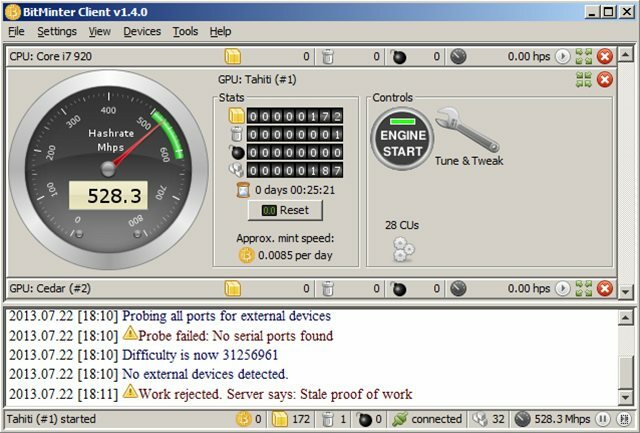 My Computer when idle uses about 490 watts. When mining for bitcoin its energy consumption jumps to 660 watts. So 170 Watts to hit 528 Mhps. Running for 24 hours this consumes about 4 KWH. This means my daily electricy usage is around $0.40. The not so easily meassured Cooling costs. From my previous figures you would think I have about $0.38 of profit per day. But we haven't taken into account how much energy it takes to keep my unit cool. I will say that the 3 fans on my 7950 move a ton of hot air. It gives you a new respect for how these cards are engineered. My guess is that it takes more than 3.8 KWH to run the AC for my small office. Where Bitcoin mining will go from here? There is good news and bad news. The good news is I see the network finally leveling out, which means this should be the end of the ever increasing difficulty level. More good news is this now helps speculators determine if their hardware investment will actually pay for itself in the long term. The bad news is the yields have finally dropped down to the GPU cost of mining, which means thousands of smaller GPU based miners are likely to get out of mining. Unless you are lucky enough to live in non metered housing ( Dorm room, older apartment complex ), mining is no longer profitable on that sick gaming rig you constructed. More good news, there is about to be a free crack give away on GPU's on ebay as guys part out their old mining rigs. The future of mining will likely be very dependent on ASIC units, especially the smaller USB based units we have all seen on ebay. If you buy them in volume, you can get those for about $80 each not including shipping on Alibaba. Anyone up for a group buy on 1000 USB ASIC units?